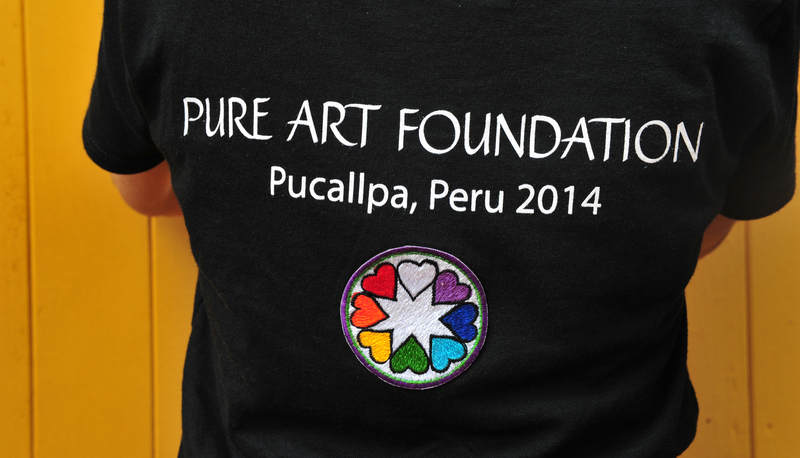 Pure Art Foundation » PERU 2014 [DAY 6]: An Incredible Collaboration Coming to a Close! As most of our volunteers have returned home, we look back on Day 6, our final day of construction, and are reminded of the incredible power of collaboration. Everyone contributed to the collective energy that allowed us to achieve what we set out to do. In joining forces with our incredible team of Peruvian construction workers, we were able to build 2 new homes. As we eagerly await move-in day for two receiving families, we wish to thank all of our passionate volunteers for joining us on this dynamic journey! A special thank you to Leslie (below left) & the Bridge to Peru fundraising event as well as Linda, Alan & Colette (below right) who respectively raised the funds necessary to build the two new homes. Your generosity & hard work will always be remembered. As an incredible week comes to a close, Charlotte brings the community together for one of the highlights of our trip: a frenetic game of “Pure Art Bingo” engaging over 120 women and children from the community! A wonderful opportunity to celebrate connections, old & new, we take away a knowledge that love overcomes all boundaries, allowing us to achieve beautiful things.